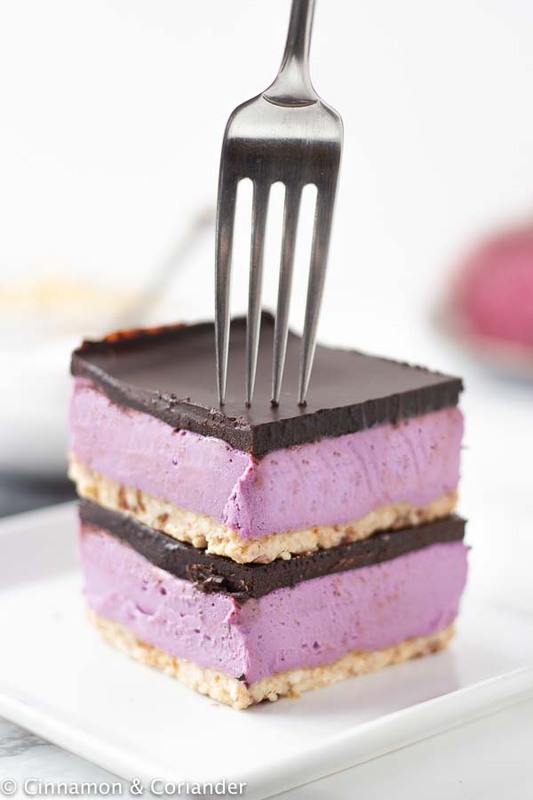 These Vegan Nanaimo Bars come with a dairy-free buttercream filling flavored with purple sweet potatoes! They are paleo, refined sugar-free and gluten-free! These Vegan Nanaimo Bars are Gluten-free, Sugar-free, Paleo & so easy to make! Guys, these gorgeous Vegan Nanaimo Bars are all kinds of wonderful! Imagine all the creaminess of the oh-so-Canadian holiday bars but without dairy, gluten and no refined sugar! YES! 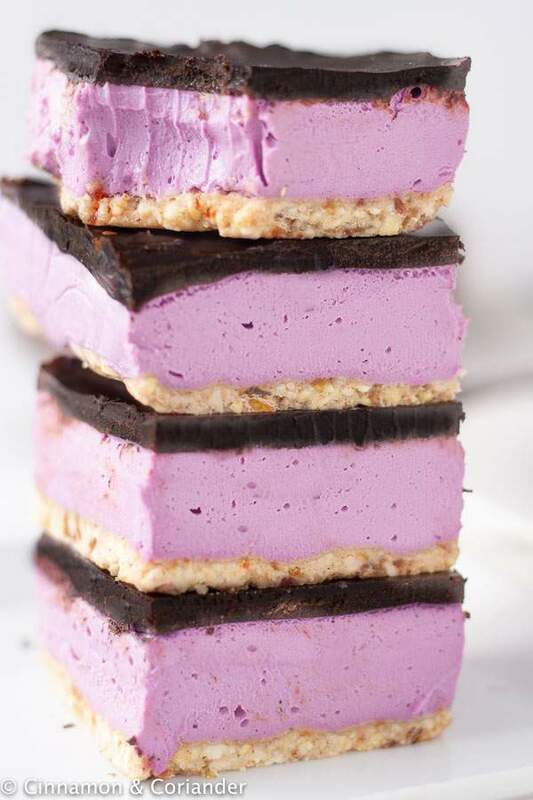 These healthy dessert bars are no-bake and come together within no time at all! To create the melt-in-your-mouth creamy richness of traditional buttercream, I use a mixture of coconut cream, cashews, coconut milk, coconut oil to create my vegan buttercream. 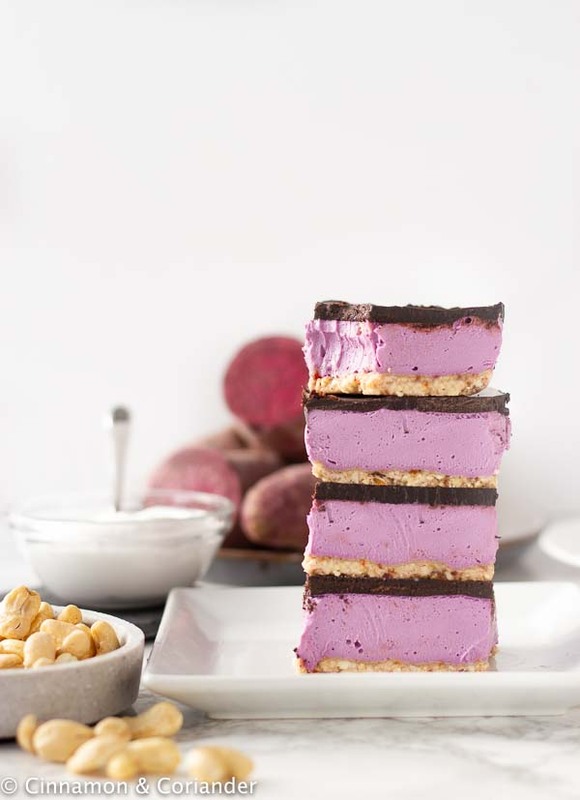 The addition of purple sweet potatoes lends a gorgeous color and a floral aroma to the vegan buttercream filling. SO.GOOD! Vegan Nanaimo Bars are great make-ahead breakfast treats or snacks that can be whipped out of the fridge whenever you feel like it! Along with butter tarts, Nanaimo bars are most likely the most iconic Canadian dessert. Nanaimo bars are dessert bars with a soft layer of yellow custard sandwiched between rich chocolate ganache and a coconut-graham crust. They are delicious but mostly butter and sugar – so nutrition-wise not exactly a justifiable choice. But bear with me because these Vegan Nanaimo Bars are a healthified version of the traditional recipe. I am absolutely obsessed with purple sweet potatoes. And you guys seem to be fans as well. You absolutely LOVED this Purple Sweet Potato Pie I made for Thanksgiving, so I wanted to create a healthy alternative to this super popular recipe. 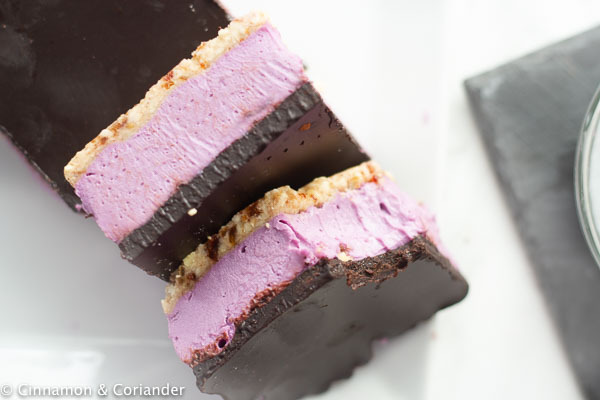 Enter these Purple Sweet Potato Vegan Nanaimo Bars! What ingredients go into these Vegan Nanaimo Bars? 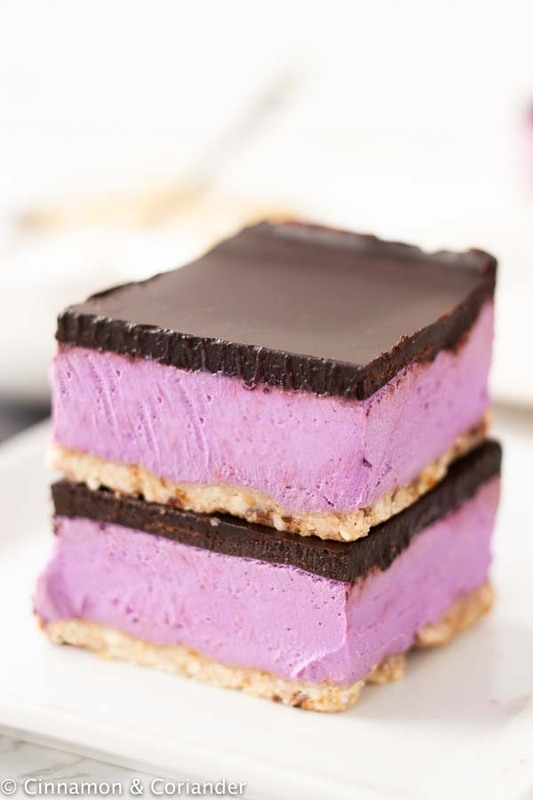 Yes, team, this means these purple sweet potato Nanaimo bars are not just vegan, but also gluten-free and paleo! Clean eating approved as well, obviously! The vegan Nanaimo Bars recipe could not be easier! We start by roasting some purple sweet potatoes in the oven. This step can be made ahead of time and I normally do this at night and let the roasted potatoes cool down overnight. This also makes peeling easier. I roasted 2 medium sized purple sweet potatoes in the oven for about an hour or until a knife can be inserted easily. Let them cool down completely! Then peel the purple sweet potatoes and cut them into coarse cubes. Weigh out 200 g.
The Vegan Nanaimo Bars crust is made by processing some pecans, coconut oil, maple syrup, dates and bit of sea salt and cinnamon. Press it into an 8×8 inch square pan and refrigerate. The filling is a cashew nut base with some roasted purple sweet potatoes for color and flavor and coconut cream, coconut oil and milk for creaminess. Blend all ingredients apart from the coconut oil in your Vitamix, then add the coconut oil and blend until smooth. There is no need to add a lot of sweeteners to the filling as the roasted purple sweet potatoes are already quite sweet. I added a tablespoon of stevia and found the level of sweetness perfect. Pour the vegan buttercream filling on top of the cashew crust and freeze for at least 2 hours. Of course, these would not be Nanaimo bars if there was no layer of vegan chocolate ganache on top. The vegan chocolate ganache topping is more than simple. You want to melt your coconut oil and let it cool down, then simply whisk in the salt, maple syrup and cocoa powder. DONE. Pour this vegan ganache on top of your vegan buttercream and chill in the freezer for another hour or two. These vegan Nanaimo Bars are the perfect make-ahead dessert. You can make them up to a week before eating, slice and store them in an airtight container in the fridge, with each slice separated by parchment paper to prevent sticking. for this recipe as it has less cumarin and is better for you than grocery store Cassia cinnamon. If you cannot find purple sweet potatoes, you can make these using normal sweet potatoes. They will be a gorgeous light orange! You can use any other nut for the crust. Almonds work well and a mix of almond and coconut is actually also really delicious! Maple Syrup can be substituted with honey but then the Nanaimo Bars will not be vegan anymore. 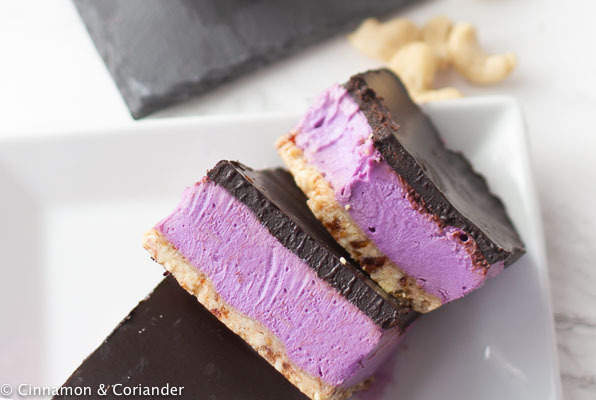 These Vegan Purple Sweet Potato Nanaimo Bars are seriously rich and filling with plenty of coconut cream and cashew nuts in the filling. Make sure to cut them into small pieces – you will not need much to get your dessert bar fix! For more vegan desserts, make sure to check out my Vegan Cookie Dough and my Vegan Chocolate Mousse! ★ Did you make and love this vegan Nanaimo Bars recipe? Give it your review below! And make sure to share your creations by tagging me on Instagram! Put all ingredients for the crust in the bowl of your food processor and blend until a crumbly mass forms. It should hold together when pressed. Line a 8x8 inch square brownie pan with cling film. Press the crust mixture onto the bottom and place into the freezer to set. In the meantime cut the cooled roasted sweet potatoes into chunks and place into your blender (I like to use my Vitamix) along with all other ingredients apart from coconut oil. Blend until a very smooth light purple cream forms, then continue blending while drizzling the melted coconut oil into the blender. Pour this mixture on top of the chilled crust and freezer for 2-3 hours. Melt coconut oil and let cool down. Mix in all other ingredients for chocolate glaze and stir until very smooth. Pour chocolate glaze on top of the partly-frozen purple sweet potato bars, smooth out with a spatula and place in the freezer for another hour. Take the mold out of the freezer and wait for 10 minutes before cutting in into squares. It helps to run a knife under hot water before cutting, to get clean slices. These look SUPER pretty. I love the colour. I will be on the lookout for purple sweet potatoes. Not always easy to find around here for some reason. Genius!! Nanaimo bars are one of my favourite desserts, and not just because I live right next to Nanaimo.. they are naughtily delicious. I can’t wait to try this healthy version so that I don’t have to skip on the goods! These nanaimo bars look so delicious. What a gorgeous color! I bet they taste so good and I love that they are vegan! That color is so vibrant! I love that this delicious dessert fits everyone lifestyle. I’ve never had nanaimo bar, and not seen them in the UK, but your vegan version looks so delicious and sooo pretty! Love the fact you’ve used purple sweet potato here, that colour is incredible! The bars looks gorgeous. I love the soft purple color and they look completely decadent. They certainly don’t look like I’d be sacrificing anything by eating the sweet potato bars instead something caloric! I’m saving this recipe to make for a nice spring dinner I’m planning. I have a couple of friends who are vegan and I’m always looking for good dessert recipes that work for them. I just love the color in these! Thanks so much! They are such an eye-catcher! Confession: I’ve never had a purple sweet potato. However, these are looking so gorgeous I’m gonna have to go grab some ASAP!!! Wowwww!!!! Purple is my color! I am def making these! Thanks so much for the inspiration :). I’ve made treats with sweet potato in place of things like pumpkin but have never tried purple sweet potatoes. What a beautiful color they make! Oh Gosh, what a treat for my eyes and taste buds. They look so pretty and loving the fact that these are vegan. Need to make asap.